A dog will bound out from behind the registration desk, clad in an "Adopt Me" vest, as visitors arrive at the Aloft hotel in downtown Asheville, North Carolina. It's believed to be the only hotel in the U.S. where guests can adopt the dog that greets them when they check in. But the hotel doesn't overwhelm road-weary travelers to this mountain tourist mecca, where people come to tour the nation's largest home, the Biltmore estate; cast a fly-fishing rod; or hoist a beer in what has been dubbed "Beer City USA." There's only one adoptable dog at a time, and it's always on a leash. The pooches at the Aloft Asheville Downtown hotel are part of an adoption program run by the hotel and Charlie's Angels Animal Rescue. The rescue saves the pets from possible euthanasia at area shelters. "We feel like we are saving lives," said Christine Kavanagh, Aloft's director of sales. Hotel and rescue workers hope the program not only becomes permanent but spreads to some of the chain's other locations, too. The Asheville hotel, which also allows guests' pets to stay for free, opened in 2012 and has not received one complaint about allergies, messes or dueling dogs, Kavanagh said. The adoptable dogs have space set aside at the registration desk, on the roof, third floor and in certain employee areas. They can't stay in guest rooms at night but can go with visitors to the restaurant, bar and other spots if they're on a leash. Caren Ferris of Amherst, Massachusetts, and her husband certainly did. 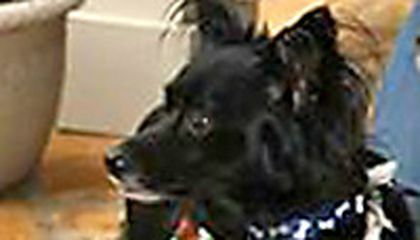 The couple were staying nearby when they met a 4-year-old terrier mix named Ginger in the hotel bar. They cozied up to the pooch sporting an "Adopt Me" vest. She and her husband filled out the adoption papers, paid $175 in fees and waited to be approved before they were able to take Ginger home to meet their other dogs. Charlie's Angels has tough adoption standards, including a home visit. If a potential owner is from another state, the rescue will ask a shelter there to do the check. The restrictions haven't stopped 14 dogs from finding homes since the program started in July, said Kim Smith, president of Charlie's Angels. The rescue's placements have doubled since the hotel started stationing the dogs. "Every time we went somewhere, one of us would say, 'Let's go back to the hotel and see Jackson.' l couldn't stop thinking about this dog," Trantham said. It's also a wonderful way for the dogs and the guests to socialize, Kavanagh said. "We have a little playpen by the front desk. At times, there's a crowd around the pen because the dog is a conversation starter," Kavanagh said. 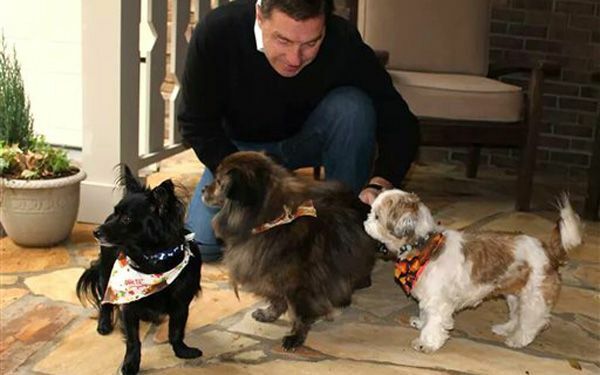 "Our hotel draws people together so they can mix and mingle and maybe adopt a dog."